I'm exhausted at the moment, but hugely excited. I've been spending evenings over the last three weeks, usually till the early hours, experimenting with a new development in online education. The Open Courseware (OCW) movement started in 1999, in Tubingen, Germany, but quickly spread to the US. The idea is simple: Take the best educators at the top universities around the world, video their courses and put them online, for free, for anyone to watch. Over the last couple of years I've watched probably a dozen or so courses on subjects from human behavioural biology, to quantum field theory (admittedly this is a little late, being Sidney Coleman, who passed away before the videos were put online), to existentialist philosophy, from science and cooking to biology at MIT. Some of these may not fall under the umbrella of OCW officially, but the idea is the same: As of the last decade, there have been a wealth of amazing materials online for anyone to access. Open Culture keeps a pretty good track of the best of the courses online here. These courses were often fantastic to watch and I learned a great deal, but there was always a large piece missing from these sets of audio or video materials, which is that they were very much uni-directional. You sat, as a viewer, and took in the information. It turns out that this sort of learning is pretty inefficient. Building up passive understanding of a subject is one thing, but building up a true working understanding of it takes exercise and effort. The act of letting it wash over you is not enough. In fact even going through the material yourself in 'revision' mode is pretty ineffective (there's a lovely paper here detailing precisely the effects of various types of learning methods). So, come the end of 2011 things started to change. Two courses were offered online from Stanford whereby not only were there video lectures, but there were online exercises in the form of multiple choice problem sets and programming assignments, all of which were marked automatically. Suddenly you were forced to understand the material (though in the case of the hugely successful Machine Learning course I'd say that, given that this was a first run, the tests didn't actually examine how much you understood the material, but more the programing language - in this case Octave - this will change in future revisions I'm sure). The other course, on Artificial Intelligence, gained over 100,000 participants, and suddenly the whole thing exploded. Sebastian Thrun said that, having lectured to so many students, lecturing to a classroom full of 200 enormously lucky individuals no longer seemed terribly efficient (I'm misquoting and paraphrasing enormously) and from this vision of the future, Udacity was born. Some of the quotes can be found in the article here which gives more outline of his vision. 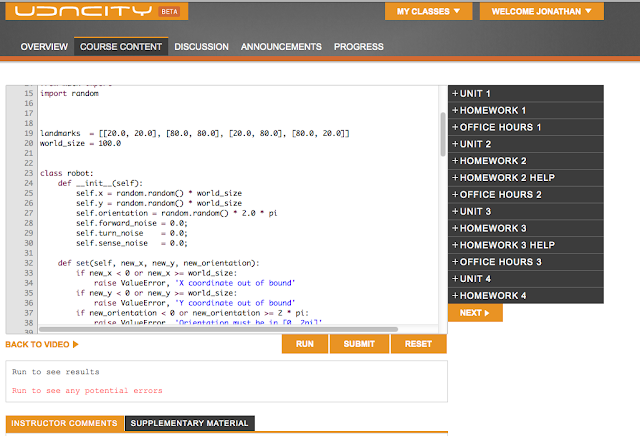 Udacity is one of several platforms which have started in the last few of weeks. Udacity aims, eventually, to give the material of an entire degree course in computer science. The modules are not coming online in a linear fashion but this means that whatever your knowledge of programing there will probably be something for you. I'm taking part in the first two courses. CS101 teaches you to build your own search engine, and is really a very basic course in Python with some simple implementations of web crawling and web searching but for a beginner in Python it's perfect. CS373 is a more advanced course and expects that you already have a good working knowledge of Python, although you could pick up what you need to know for this in a matter of a few hours. The course is based around programing a robotic car - like the car that Google used to win the Darpa Grand Challenge (a challenge whereby an automated car has to make its way through long and complex real-world road situations). In this course you learn a great deal about robotics and designing intelligent computer systems for navigating complex environments. Udacity is going to be offering more courses starting in April. Each course, I believe, will last on the order of a couple of months and at the end you get a certificate based on the marks you get in your homework assignments. Typically there are an hour or so of lectures a week and the lectures themselves are built around solving problems for yourself - you learn as you move through the lectures by solving the puzzles as you go. Here is a screenshot from one particular programming assignment in the course - not homework, but just a question that is given as you move through the second unit. This is all done online and you program directly into the browser. You can see above the format of the class whereby not only are there lectures and homework, but also a hugely active discussion area where students discuss the course, pose questions and build understanding together. So, that's Udacity. At the same time, another organisation, Coursera has come online and is offering 15 or so courses on everything from Natural Language Processing to Anatomy. They also have an ever-evolving wiki page which will allow the students to write their own online version of the course which will evolve with ever-better explanations of the concepts discussed. What is immensely important with respect to all of these online courses is that every one of them is completely free! As of this year, and, I predict, in vastly increasing numbers, you can now get some of the highest quality education in the world, online, for free. Anyone, in any country, with an internet connection, can register, log in and learn with some of the best educators in the world. This is mind-blowingly powerful stuff! I'm hugely excited to see what this will do for the younger generation of students (high school included) who are dying to get immersed in all this stuff but up until now simply haven't had the resources (not only the material, but also the interaction that this will now allow). Anyway, I highly advise delving into these courses and even if something doesn't pop out now that appeals, I think that within a very short space of time, the vast library of online, interactive information available will have something to tickle your brainbuds. Also, find out more here at Learning Without Frontiers, about how disruptive technology may be able to shift the status quo. Great post Jon. Have you looked into ItunesU? Its Apple take on the subject. Sadly I think its only available on the ipad, its pretty much like coursera except they have more courses from a bunch of different universities. yes, itunesU I have been using for a long time, but it's very one-way. You watch, and absorb what you can. The real revolution is in the interactive nature of these current courses. Or have I missed something in itunesU, are there exercises which are automatically marked to do to? Great post on an important subject Jonathan, but you have not missed any exercises in iTunesU; it is as you say only one-way.